Each week we pause to reflect and refresh as we celebrate Shabbat. On the 1st, 3rd, and (when they occur) 5th Fridays of the month, we celebrate the beginning of Shabbat with Kabbalat Shabbat services. We begin at 5:30 pm with Likrat Shabbat (the community oneg – reception), a time to socialize with friends and enjoy a small nosh together. Candle lighting and Kabbalat Shabbat follow at 6:05 pm with a 45-minute worship experience filled with joyous song. On the 2nd and 4th Fridays of the month we gather at 7:30 pm for Shabbat evening services, generally including a Torah reading and D’var Torah (sermon). Following services we gather at an Oneg Shabbat to share dessert and conversation. Usually on the 2nd Friday of the month throughout the school year, Shalom Shabbat is an event especially geared to the presence of young children (tots through 5th grade). We begin at 6:00 pm with visual t’fillah, a brief PowerPoint service, followed by a catered Shabbat dinner, Israeli dancing and dessert. On the 4th Friday of June, July, and August Temple Beth Israel members, friends, and guests gather in a local park for Kabbalat Shabbat worship and Shabbat picnic dinner with a potluck dessert. The High Holy Days provide each of us an opportunity for personal reflection and introspection, as well as communal celebration and thanksgiving. The entire Hebrew month of Elul leads up to Rosh Hashanah, the beginning of the New Jewish Year; the last few days of Elul are given over to special prayers seeking forgiveness. Rosh Hashanah is introduced by the Selichot service held late on Saturday night before Rosh Hashanah. We begin with a study session, followed by a moving ceremony to change the Torah covers from the colorful mantles used throughout the year to the white mantles used during these Days of Awe. This ceremony leads into a stirring service, written especially for our congregation to awaken us to the dawning of a New Year and to inspire us to be the best that we can be. “Today is the birthday of the world!” proclaims the prayer book for the High Holy Days. On Rosh Hashanah we transform the auditorium of Evanston Township High School into a beautiful sanctuary in order to accommodate all who want to join together as one congregation to welcome the New Year. Our service begins at 8:15 pm and includes words of inspiration from our rabbi and the beautiful music of our High Holy Day choir. At 10:00 am we resume our congregational worship at Evanston Township High School. Our morning service includes the reading of Torah, a special D’var Torah and the stirring sounds of the Shofar service – all accompanied by our High Holy Day choir. At 9:00 am on Rosh Hashanah our rabbi leads a special Rosh Hashanah Young Families Service. We use our unique “big book” prayer book. This service is designed primarily for children five and under and their families (grandparents welcome!). At 10:00 am our rabbi leads a Rosh Hashanah Family Services geared for children who read. We use our unique family prayer book created especially for Temple Beth Israel families. Parents accompany their children to this service and then are invited to join the main congregational service (already in progress) while children (grades Pre-K through 2nd grade) participate in holiday activities planned and supervised by our YES Committee volunteers. At 10:00 am on the 2nd Day of Rosh Hashanah, we continue our congregational worship in our home sanctuary at Temple Beth Israel. This intimate Rosh Hashanah service includes special participation by members of Sisterhood Temple Beth Israel. “Prayer, repentance and righteousness avert the severe decree” proclaims the prayerbook for the High Holy Days. Once again on Yom Kippur we transform the auditorium of Evanston Township High School into a beautiful sanctuary in order to accommodate all who want to join together as one congregation to observe this most solemn day of the year. The haunting melody of Kol Nidre ushers in this time of repentance and fasting, as together we confess our sins and resolve to do better and be better. At 10:00 am we resume our congregational worship at Evanston Township High School. Our morning service includes the reading of Torah, a special D’var Torah and our High Holy Day choir. At 9:00 am on Yom Kippur our rabbi leads a special Yom Kippur Young Families Service. We use our unique “big book” prayer book. This service is designed primarily for children five and under and their families (grandparents welcome!). At 10:00 am our rabbi leads a Yom Kippur Family Service geared for children who read. We use our unique family prayer book created especially for Temple Beth Israel families. Parents accompany their children to this service and then are invited to join the main congregational service (already in progress) while children (grades Pre-K through 3rd grade) participate in holiday activities planned and supervised by our Director of Congregational Learning. The seasons of the year are punctuated by the sacred times of the Jewish calendar. These Festivals and Holidays are opportunities for us to gather together in joyous celebration, to commemorate significant events of our collective history, and to give expression to the important ideas of our tradition. “In every generation, each of us should view ourselves as though we, ourselves, went forth from Egypt.” So the Haggadah urges us to link our experience with that of Jews in every generation. At Temple Beth Israel we do this by joining together for worship at 10:30 am on the morning of the 1st day of Pesach and the morning of the 7th day of Pesach. Each of these services includes festive singing, Hallel (special Psalms), and reading of a special Torah portion. On the 7th day of Pesach we also include Yizkor. On the 2nd night of Pesach Temple Beth Israel hosts a communal Seder for all those who choose to join in celebration of the Exodus from Egypt. Led by our rabbi, the Seder includes telling the story of Pesach with all its symbols, a festive meal, and much singing. The Festival of Shavuot comes seven weeks after Pesach. On that day we remember standing as one Jewish community at the foot of Mt. Sinai and receiving Torah. Our observance usually includes an evening Torah study program, a morning worship service including festive singing, Hallel (special Psalms), reading the Ten Commandments from the Torah, and Yizkor. The changing of the leaves and the fall harvest season inspire in us a profound sense of gratitude. On Sukkot we decorate a beautiful Sukkah in our sanctuary and give thanks for the bounty we share. On Erev Sukkot we celebrate with family-focused celebration. On Sukkot morning we gather together for worship, including festive singing, Hallel (special Psalms), and shaking the lulav. The 8th day of Sukkot is a holiday unto itself, known as Sh’mini Atzeret. 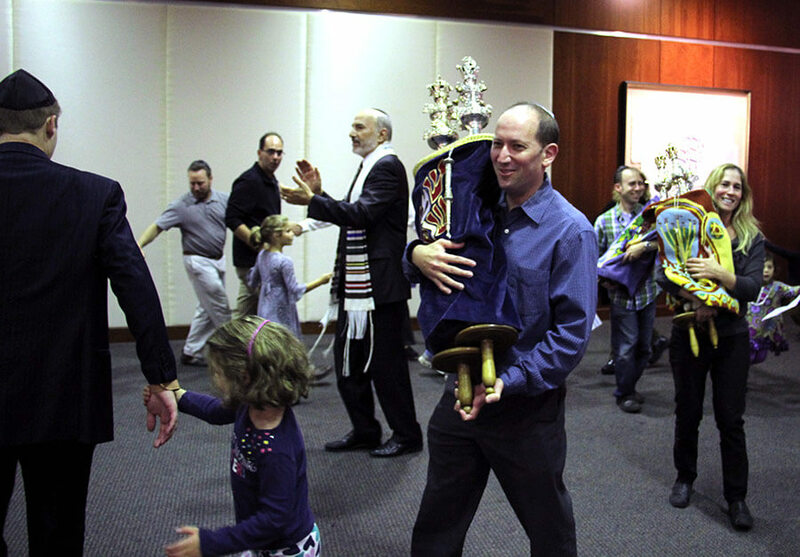 The rabbis of the Talmud added Simchat Torah for festive rejoicing with the Torah. On Erev Simchat Torah we gather for a parade and dance with the Torah; we read the final verses of the Torah followed immediately by the reading of the opening verses of the Torah. Our morning worship service includes festive singing, Hallel (special Psalms), and the reading of special Torah portions, and Yizkor. “A great miracle happened there,” says our tradition – the miracle of how the few triumphed over the many and won the battle for the freedom of religious expression. With our menorah ablaze we celebrate the victory of the Maccabees: We hear about Uncle Louie’s Latkes on Shabbat Hanukkah and we join with TBI Brotherhood for our annual Hanukkah party. With unbridled revelry we read the Megillah and try our hardest to drown out the name of the wicked Haman (booo!). Our celebration continues with the annual Purim carnival co-hosted by TBI Brotherhood and our youth groups. Every other year we are treated to an original dinner-theater Purim Shpiel. Get out your costumes and enjoy the hamentaschen. Each year on the 27th of Nissan, we commemorate the destruction of European Jewry during World War II. Our moving candle lighting ceremony is followed by a program or speaker to help us observe this sad day. As a congregation with strong Zionist leanings we come together to observe Yom HaZikaron (Israel’s Memorial Day) with a solemn ceremony of remembrance and to celebrate Yom HaAtzmaut (Israel’s Independence Day) with food, fun and song. The 9th day of the month of Av is the day on which the Jewish people remembers the destruction of the Temple in Jerusalem in 586 BCE and again in 70 CE. On Erev Tisha B’Av we gather for an evening of learning and discussion and to read Eicha (the Book of Lamentations).